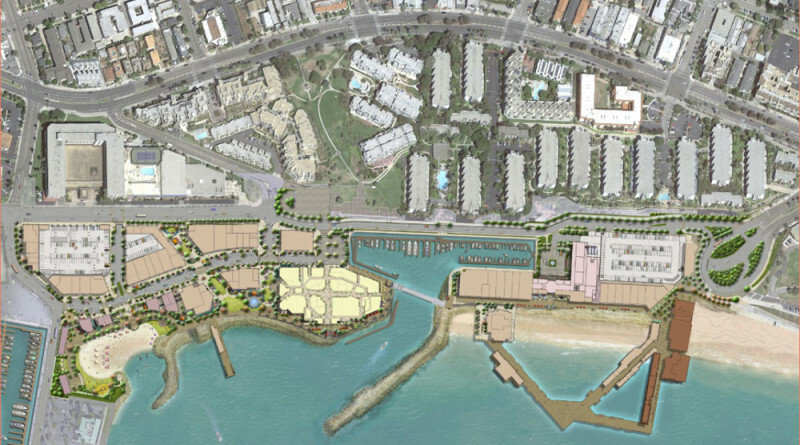 CenterCal Properties “Waterfront” project proposed to revitalize the Redondo Beach 150-acre waterfront. The project has garnered support and opposition since details of the project made its way to residents, stakeholders and interest groups in recent months. Commissioners need more time to review authoritative document, public testimony. REDONDO BEACH — After weeks of waiting and more than 100 speakers testifying deep into the evening the Redondo Beach Harbor Commission asked boating interests and local residents to wait a little bit longer before knowing how city officials will vote on the waterfront revitalization’s Final Environmental Impact Report (EIR). The EIR was on the Harbor Commission’s July 18 agenda and drew more than 100 speakers during a public comment period. After hours of public testimony the commissioners agreed to hold off on the EIR vote until Aug. 8. Commissioners said they needed more time to review the lengthy EIR. El Segundo-based CenterCal Properties partnered with the city of Redondo Beach to design and build “Waterfront,” a project proposing to revitalize 36 acres of the city’s 150-acre waterfront. More than 200,000 square feet of building space will be demolished and, according to plans, be replaced with a cinema hall, creative offices, dining options, a public market hall, retail shops and a boutique hotel. CenterCal’s “Waterfront” proposal garnered quite a bit of support and opposition since details of the project made its way to residents, stakeholders and interest groups in recent months. One group, Rescue Our Waterfront, filed a ballot initiative a few weeks ago to challenge CenterCal’s plans, which currently comes with a $300 million price tag. The group claimed CenterCal is essentially building a mall – at the expense of boating interests – on the Redondo Beach waterfront. Others gave CenterCal credit for being patient and working with Redondo Beach’s civic leaders, residents and business interests in crafting the best possible plan to upgrade the local harbor. “It is time for upgrades and at the choosing of the City Council CenterCal was selected to bring those upgrades to life in the form of significant redevelopment,” Dinah Lary, who worked at the harbor and lived in Redondo Beach, wrote in an email to city officials on July 16. “After months of input and countless revisions CenterCal has patiently listened and stayed on track to do something we can all be proud to call our own backyard. “It isn’t all going to be perfect for everyone, but there will be something for everyone,” Lary continued. Another interest group, Building A Better Redondo (BBR), formally requested more time to do its own review of the EIR documents. One of BBR’s major concerns is how could the sportfishing pier and number of slips in Basin 3 be affected by variations of the EIR’s alternatives. Meanwhile there has been a debate of where to place a boat launch ramp. The harbor currently does not have a boat launch ramp and only provides boaters with one functioning hoist to transfer a vessel from trailer to water. Mark Hansen of King Harbor Boating Foundation’s Waterfront Education said most community members prefer the boat launch ramp to be at Mole C, while the city proposed the ramp to be at Mole B. Rescue Our Waterfront, however, seeks to have the boat launch ramp built at Mole D, the farthest end of the harbor from the main entrance. The Harbor Commission will weigh in on all these issues and more on Aug. 8, when they will meet at 6:30 p.m. in Council Chambers and possibly decide whether to move forward with the EIR as drafted or recommend an alternate action. In other news two co-founders of the Rescue Our Waterfront movement were unsuccessful in their respective bids to be appointed to a vacant seat on the Redondo Beach City Council. Nils Nehrenheim and Martin Holmes were among the 16 candidates who sought to be appointed to the City Council’s District 1 seat vacated by Jeff Ginsburg. The now former city council member stepped down from his elected seat to attend to a family illness. District 1 covers the southernmost section of Redondo Beach; it’s upper border tickles Redondo Beach Harbor. The council appointed Martha Bartee, a former startup sales executive, to fill Ginsburg’s seat.